The Fortuny ferry can carry up to 1000 passengers and 330 vehicles. As one of Trasmediterranea’s fleet of superferries, Fortuny has the most sophisticated and comfortable facilities making your journey an enjoyable experience. Onboard you’ll find a la carte and self-service restaurants, café, pub, swimming pool, jacuzzi, solarium, gym and sauna, a reading lounge, a games lounge, baby changing area, nursery, heliport, cinema, pet kennels, medical facility and a shop. 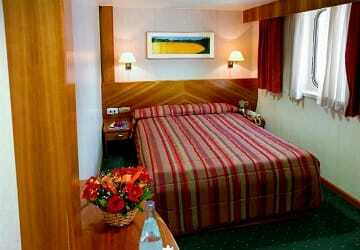 There is a selection of onboard cabin accommodation in a choice of 2 and 4 berth, standard and club class. Onboard you’ll find a café-pub, an a la carte restaurant with a very chic atmosphere and a self-service restaurant offering a wide selection of food. 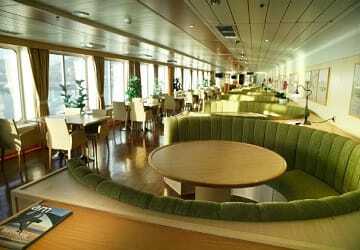 There are bars both inside and on deck and snack dispensing machines. In the onboard shop you’ll find a range of different products such as clothing, souvenirs, books and magazines, confectionary and sweets, perfumes and jewellery. There is a swimming pool that's open year-round (covered and heated in winter), you can relax in the jacuzzi, sauna and solarium or if you want to keep fit during the crossing then visit the fully-equipped gym. There is also an onboard cinema where you can watch the latest films. There is a nursery with soft toys, tables and chairs, and a TV. 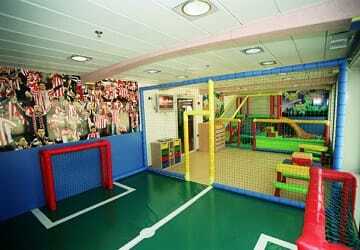 Children can also enjoy the shallow area of the swimming pool and can play board games in the games lounge. Please Note: Whilst we have taken great care in making our Fortuny guide as accurate as possible, onboard facilities, services and entertainment may vary depending on the date and time of year that you travel, facilities mentioned may change without notification and ferry companies reserve the right to operate vessels other than those mentioned at time of booking without prior notification. nice and clean ship. Departed on time and the aircon was on. In short, a successful boat trip !!!! 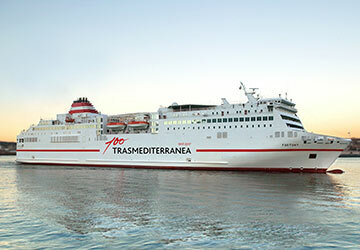 "Trip with transmediterarranea - Fortuny from Malaga to Melilla"
It was an excellent and unforgettable trip. A very smooth and comfortable crossing. The only downside was the loading crew who caused more confusion than coordination, too much drama and noise and not enough direction. We stayed overnight in a dobbelbeded room with a clean bathroom. Only vibration of the engine affected a Deep sleep. My family flew on holiday to Palma, but as I dislike flying so I took the train from the UK to Barcelona and the overnight ferry to Palma, and the day trip on return. I had my own cabin on the way there, a reserved seat on the way back. In general the trip lived up to expectations. The cabin was excellent, a nice shower, basin and toilet, and comfy bed. On the way back I got to the ferry early, so could pick a seat with a plug point to work on my laptop, be aware there are only a couple of these at the back of the room. Boarding and disembarking for foot passengers were simple at the Barcelona end, but difficult at the Palma end as the ferry docks in a different terminal and then a transfer is required on a bus (both for arrival and departure). This was not obvious to a non-native Spanish speaker and caused some confusion both times. The public toilets on the return journey were not particularly well cleaned but everything else was reasonably clean and tidy. These were all small gripes, and overall I would be happy to take the ferry again. My experience was totally different at the outbound and the return. The departure to Palma was less comfortable, the ferry left almost with one hour delay. Nobody was controlling on board that the passengers that had booked a seat got one. I realized that some people had to spend the night at the bar. The return was better and the boarding more faster. Also a different and a better ferry. THE WORST IS THE SHORTAGE OF TOILETS. ONLY THREE TOILETS FOR WOMEN. CAN YOU IMAGINE AT 8AM, HOW CROWDED WAS THEM? The seating room is very uncomfortable and not very clean. There is no organization at the time to assign the seats, they should be enumerated. It was a good and beautiful experience. The sights are espectacular, you are not able to have these views from any other transport means, beside the possibility of travelling with your car. "Trip from Mahon to Barcelina early August"
I cannot praise the staff and crew of Neptuny high enough. It was an excellent day crossing, blue skies and very flat sea. We relaxed on th sun deck and ate in the excellent Italian restaurant where the quality of the food and attention of the staff was very high. Transmedittaeranean even organised for a pod of dolphins to put on a fantastic aquatic gymnastic display for us mid Med... The ship although old was in good condition, we left and arrived on time. I highly recommend this company. "Barcelona - Palma - Barcelona"
I travelled between Barcelona and Palma in July 2014 with Transmediterranea. I booked my ticket online at home before arriving in Spain. The process was easy after printing of the confirmation all i was required to do was arrived and have the tickets printed before boarding. I found the ride most enjoyable, with a television to watch the soccer, plenty of room to sleep, as both times i travelled overnight as well as free wifi whilst onboard. Service provided was incredibly helpful with friendly staff. Food and beverages available was great for my time of travel as well as reasonable in price. The option to go outside and watch us sailing by was beautiful during the early mornings and late nights. I would definitely recommend travelling with Transmediterranea as the trip was most enjoyable, and if the opportunity arrises i would definitely use their services again. "a return crossing between Barcelona and Palma"
Like every year, we are going to Mallorca where our children live. We travel with Acciona and are very satisfied with the company. We had a comfortable and quiet trip. Looked up our cabin after having parked our car. Enjoyed the nightly views of Barcelona from open sea. Wandered around the ferry and slept til the alarm went off, so all in all a pleasant experience. 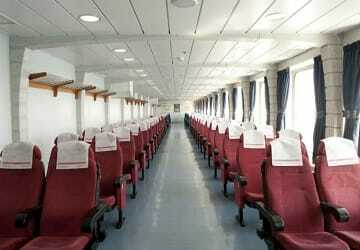 Clean ferry, the small amount extra for a cabin is highly recommended. "Crossing from Barcelona to Palma"
I am satisfied with my crossings, the cabin is very clean and confortable, the staff on board is pleasant and professional. I will do it again. "Very good, I would recommend it!" Very good. I would recommend! An excellent service. "Really recommend this website "
I can only say that our trip was perfect. No incidents and therefore 100% recommended.